Virtual business customer premises equipment (vBCPE) offers tremendous cost and service provisioning advantages for communications service providers, but must match the performance and reliability of the discrete CPE devices they are replacing. A key component of this carrier-class reliability is selecting the correct Network Functions Virtualization (NFV) software platform. 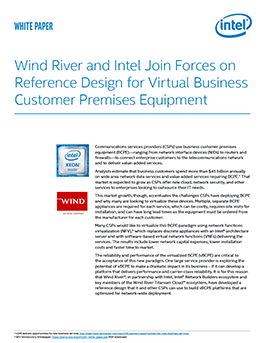 Wind River® has teamed up with Intel® and its virtualized network function (VNF) partners, ADVA, Brocade, Check Point, and Riverbed, to develop a reference design that combines the performance, reliability, scalability, and manageability required for this application.